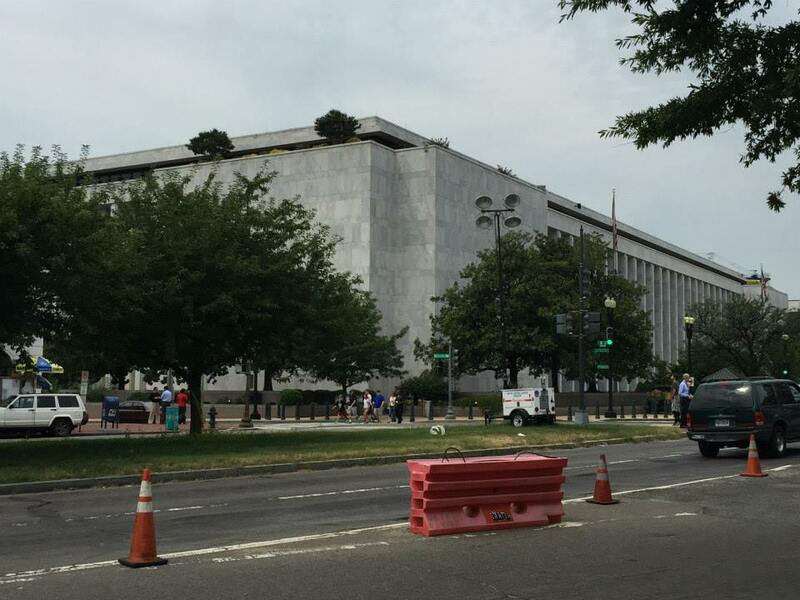 The US Capitol. Courtesy of Justin Clark. 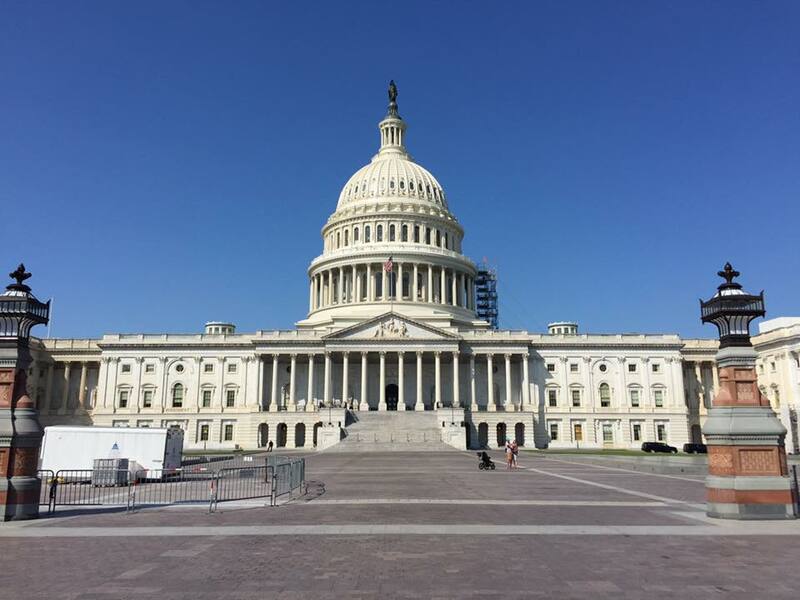 This past week, I went to the National Digital Newspaper Program (NDNP) Awardee Conference in Washington, D.C., with my colleague Jill Weiss. It was an informative and inspiring conference. The first day, we met at the National Constitution Center and we welcomed by the chairman of the National Endowment for the Humanities, Dr. William D. Adams. In his brief remarks, he emphasized the commitment that NEH has to the program and his belief in its importance to the public good. As a public historian, I was motivated by his call to make Chronicling America (the national digital newspaper repository) more accessible to the public. He also shared with us the big news about the program: the date range is expanding! This new date expansion will cover 1690-1963, which means that awardee states can do so much more for Chronicling America. 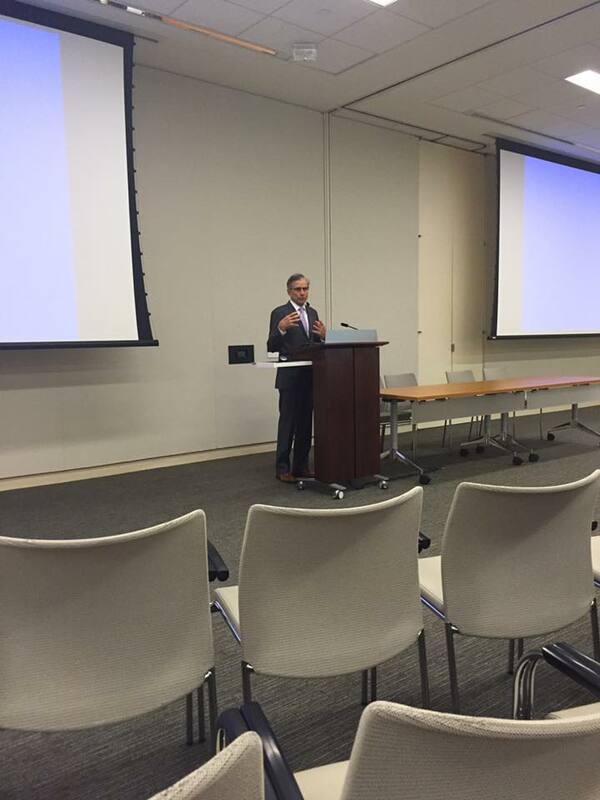 NEH Chairman Dr. William D. Adams speaking at the NDNP Conference. Courtesy of Justin Clark. 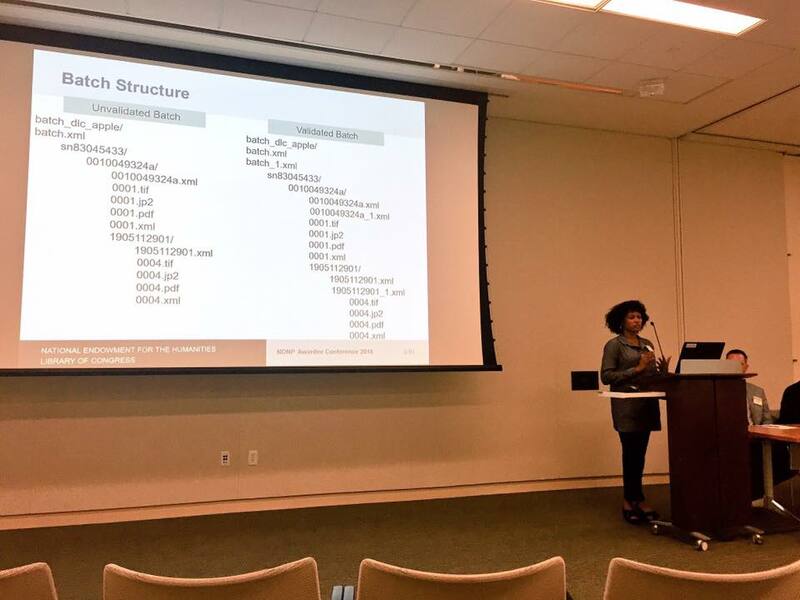 Leaning about the technical specifications for the NDNP with Tonijala Penn from the Library of Congress. Courtesy of Justin Clark. During the first day, we learned about the specific program needs for Chronicling America, including newspaper essays that explain the history of a title, deliverable products submitted to the Library of Congress, and the ins-and-outs of preparing newspaper titles for microfilm and digital preservation. These talks were especially important to a new program assistant like myself, who needs to know all the important tasks for the NDNP. Additionally, we watched a live-stream of the swearing-in of the new Librarian of Congress, Dr. Carla Hayden. In her speech, she called for the Library of Congress to make its own history by making materials more easily available to the public. With NDNP, we are doing just that. 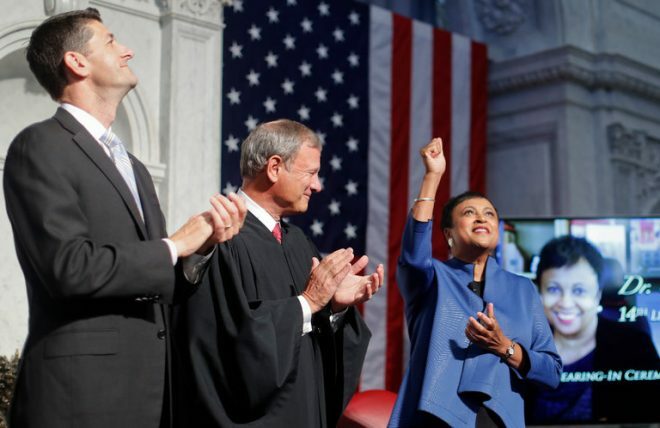 Dr. Carla Hayden, the 14th Librarian of Congress, during her confirmation ceremony. Courtesy of District Dispatch. 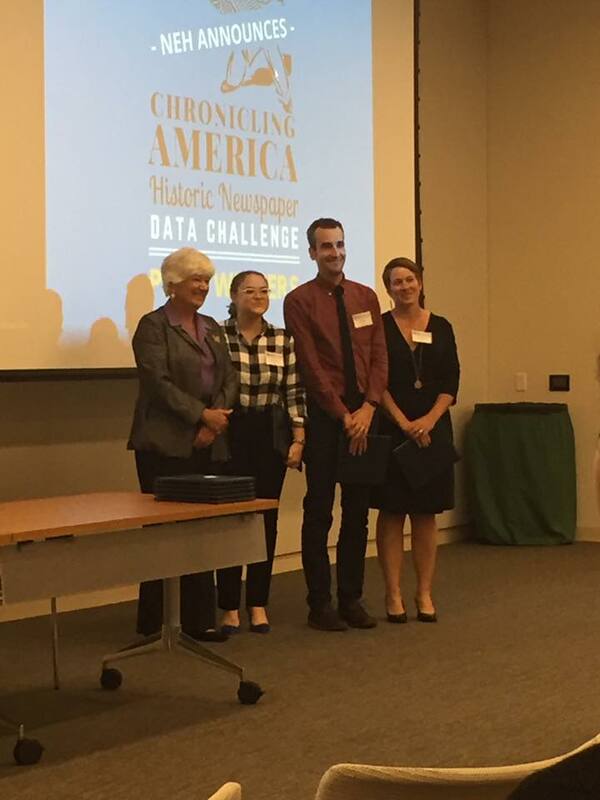 In the afternoon of the first day, winners of the NDNP’s Data Challenge Awards presented on the innovative and creative ways they are using digital newspapers through Chronicling America. George Mason University professor Lincoln Mullen shared his research on the use of the Bible in American newspapers and how it showed religious trends during the late nineteenth and early twentieth centuries. Andrew Bales, a doctoral student from the University of Cincinnati, created a database for chronicling the horrific history of Lynching in the American South. Ending the first session, Amy Giroux, Marcy Galbreath, and Nathan Giroux from the University of Central Florida explored agricultural trends through their own aggregator of newspapers called Historical Agricultural News. IUPUI librarians Caitlyn Pollack (Second from left), Ted Polley, and Kristi Palmer accepting their NDNP Data Challenge Award for their work on “Chronicling Hoosier.” Courtesy of Justin Clark. 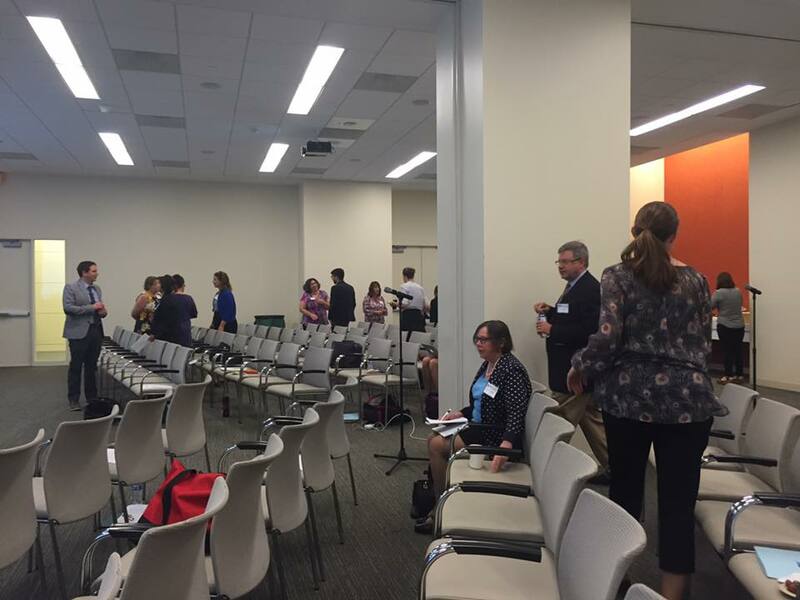 NDNP Conference attendees during a break. Courtesy of Justin Clark. History teacher Ray Palin and student Virgile Bissonnette-Blais from Sunapee High School in New Hampshire displayed their project chronicling pivotal events in American history such as Plessy v. Ferguson. Ending the data challenge winner presentations, Professor Claudio Saunt and engineer Trevor Goodyear from Georgia shared with us their winning project, USNewsMap.com, which provides a timeline-based “heat map” on newspapers based on search queries. For those interested, it does work on proper nouns as well as regular search terms (I asked). The Library of Congress, Madison Building, where days two and three of the conference were hosted. Courtesy of Justin Clark. The second day mostly focused on working with bilingual and multilingual newspapers, copyright issues, and the production aspects of NDNP. The main session that day for me was the production session, where awardees that are new to the program learn the basics of microfilm and digital preservation. We learned how to organize film, correct technical specifications for digital files, and preparing those files for the Library of Congress and Chronicling America. While it was a lot to take in for a two-hour session, the production talks were vital to my understanding of all the tasks necessary for working on the NDNP. Our last day involved a nice, open ended morning session for brainstorming marketing and outreach. We learned different marketing strategies for Twitter, Facebook, and other social media outlets, as well as other fun ways to get people to Chronicling America. My Hoosier State Chronicles colleague, Jill Weiss, asked questions about how we could get a podcast off the ground (something we’re working on for the future). The ground shared some of their favorite podcasts to check out for ideas and seemed very receptive to our idea. Like with the Data Challenge winners, I loved learning about all the creative ways that we can use NDNP content to reach users. Overall, this was a very fun and informative conference and I look forward to applying much of what I learned to my tasks on this program. Stay tuned for more, and as always, happy searching!